Blackpool striker Ishmael Miller has promised fans that there will be more goals to come from him after his first half equaliser earned the Seasiders a hard-fought point against play-off chasing Middlesbrough. After a tricky start to the season the 27-year-old was also keen to let the club’s followers know that things were looking up at Bloomfield Road and that the players were building in confidence following the ‘Boro result. 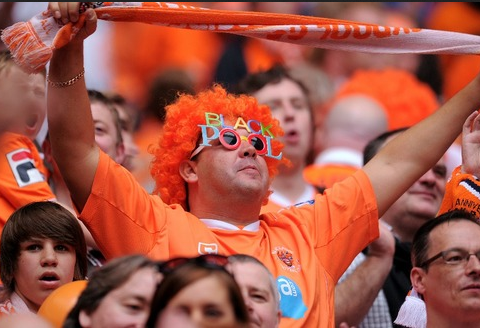 Miller’s equaliser against the team that he spent the 2012-13 season on loan at was his first for Blackpool since his permanent move from Nottingham Forest in the summer. With Jose Riga’s side sitting rock-bottom of the league and currently odds on favourites in the Championship betting to be relegated, Miller’s 25th minute strike was a timely reminder of what he is capable of and he was keen to reassure fans that he would add to his first goal of the season. “I’m really pleased to have got my first goal for the club and hopefully there’s a lot more to come now,” said Miller, who notched 10 league goals in 19 games whilst on loan at Yeovil Town last season. “As a striker you go through spells like that but I’ve always believed in myself. I always feel like I’m a threat and it was great to score,” he added. Goals have been the real sticking point for Blackpool this season so far, with the team having scored just five in their ten games, aside from the 1-1 draw against Boro, the club’s only other points this term have come from 0-0 draws against Brighton and Wolves. There are currently six teams in the league with worse defensive records than Blackpool so if Miller and the club’s other attacking options can start to take a few more chances then Riga’s men may be in with a distant chance of surviving. Having been relegated with Yeovil last season Miller is desperate for Blackpool to avoid the same fate and, after a turbulent few months in which Riga has essentially built his whole squad from scratch, the former Forest man is starting to see real signs of hope at Bloomfield Road. Blackpool are currently five points from safety with the other two teams in the relegation zone- Fulham and Bolton- meeting in a must-win game tonight. Blackpool host Cardiff City on Friday night and, with the Bluebirds having disappointed so far this season, they must take the opportunity to spoil Russell Slade’s party and give themselves a much-needed win.